There is something magical about the unpredictable surface effects that result from atmospheric firing techniques. Unfortunately, these types of kilns aren’t accessible to many potters. 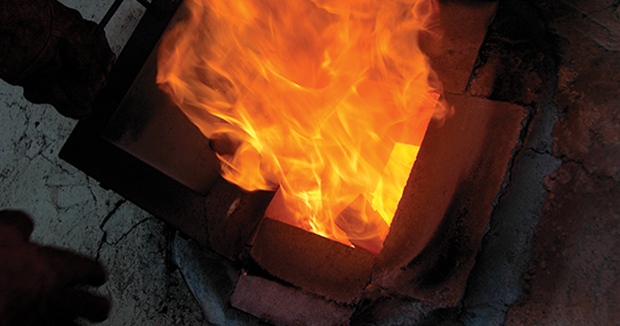 But, as Steven Hill points out in this post (an excerpt from the March 2012 issue of Ceramics Monthly), firing to cone 6 in an electric kiln does not mean you can’t get beautiful atmospheric-like results. Read on to discover how Steven makes it happen (and for some glaze recipes!). – Jennifer Poellot Harnetty, editor. Platter, 16 in. (41 cm) in diameter, thrown and altered porcelain, with ribbed and trailed slip, multiple sprayed glazes, single-fired to cone 6 in an electric kiln, 2011. Fuel-burning kilns tend to be much larger than electric kilns. Because of their size, they usually have a slower heat rise, a soak at the top temperature, and slower cooling cycles. If you want similar results from an electric kiln, especially when firing to cone 6, one of the most important things you can do is emulate the heating and the cooling cycles of larger kilns. This means slowing the temperature gain to about 100°F (38°F) an hour during the last several hours of the firing, soaking the kiln at the top temperature, and then down-firing to slow the cooling cycle. Electric kilns are built with thinner insulation and legs (to allow for air circulation), and they cool very quickly, especially at higher temperatures. If you are seeking buttery, matte surfaces but have trouble achieving them in the electric kiln, it is most likely due to fast cooling. Matte surfaces are usually caused by microcrystal growth during cooling, and, if the cooling cycle is too steep, there isn’t enough time for crystals to develop. In extreme cases, I’ve even seen matte glazes go glossy and transparent. I came to electric firing with a basic understanding of the significance of the cooling cycle but had my eyes further opened after reading The Many Faces of Iron by Dr. Carol Marians in Glazes and Glazing: Finishing Techniques. Originally published in the June 2007 issue of CM, the article describes a controlled experiment in which one application method, one clay body, one forming process, one firing cycle, and seven different cooling cycles were applied to one cone 6 iron saturate glaze. Amazingly, the results looked like seven different glazes. This started me on what will likely become a lifelong experiment with cooling cycles. Currently I am cooling the kiln naturally from the top temperature down to 1700°F (927°C), down-firing for five hours between 1700° and 1500°(816°C), and then cooling naturally. With this cycle, I am achieving some of the best microcrystalline formations I have ever had. 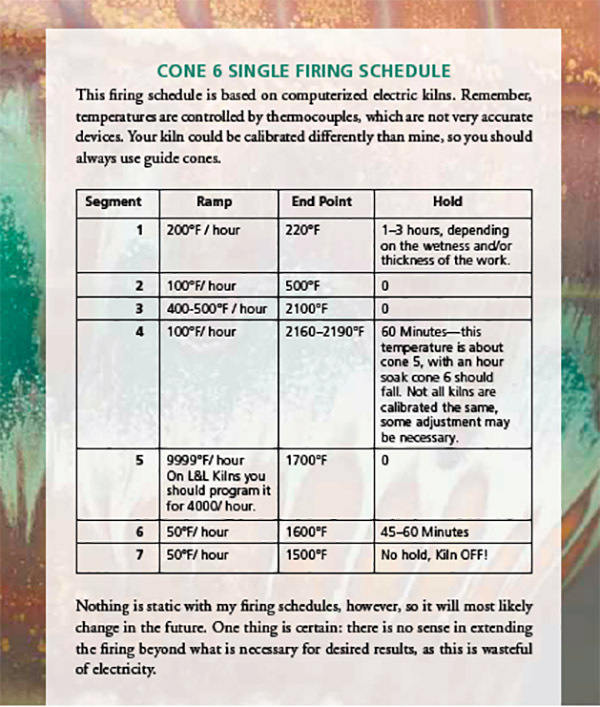 I fired cone 10 gas reduction for 38 years, but, when I began electric firing, I knew it was time to drop my firing temperature in order to preserve elements and electricity. My first experiments were at cone 8, but, to make the final transition to cone 6, I needed to reformulate glazes. With the help of my science/art-major assistant, Mike Stumbras, and Digitalfire’s glaze calculation program Insight, I was able to make the transition rather smoothly. It’s beyond the scope of this article, but I have found the journey from cone 10 to cone 6 inspiring, and it has revitalized my sense of experimentation. In electric firing—and especially at cone 6— it is natural to achieve flat, solid colors that look more paint-like than glazes in reduction firing. If you are seeking a softer effect with more variation and atmospheric qualities, it is up to you to achieve it through glaze application. Remember, the atmosphere is static in an electric kiln, and it’s not going to happen naturally! Throughout my career, there have been occasional “Ah-ha!” moments, backed up with lots of hard work. The latest revelation came through a conversation with Pete Pinnell, in which he helped me understand how I made the transition from gas reduction to electric oxidation as easily as I did. According to Pete, “In reduction firing, glazes can stratify into layers during the course of the firing. Longer firings and slower cooling cycles, along with the effects of reduction, can result in the creation of complex structures that can result in a variety of beautiful visual effects. Even seemingly opaque glazes can have enough translucency for one layer to subtly affect the next, creating variation and softness in surface color. In oxidation, shorter firing cycles, faster cooling, and an oxidizing atmosphere can result in less layering, simpler structures and less interesting visual qualities.” It just so happens I have been spraying multiple, undulating layers of contrasting glaze on my pieces for most of my career in an effort to achieve a more atmospheric look. In effect, my sprayed layers are accomplishing what happens naturally in reduction firing, and these layers give my surfaces the softness and variation commonly associated with reduction firing. If you apply thin coats of two or more contrasting glazes, they will intermingle as they melt, but the layers never mix thoroughly. The result shows up as soft and subtle surface variation. 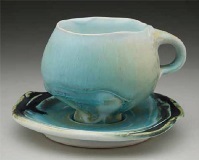 You can apply multiple layers by any number of methods—dipping, pouring, brushing, splattering, sponging, etc.—but spraying gives you the opportunity to subtly modulate the thickness of each layer, varying glaze surface and color in a way that has the potential to look natural and organic. A totally separate issue in the oxidation vs. reduction debate is color development. Some coloring oxides change color when fired in reduction. The most dramatic of these is copper, which changes from green to red. So, I’m not trying to say that my oxidation-fired pots look just like they would in reduction, but rather that they have all of the subtleness and variation that they once had when fired in reduction and that many of them show no appreciable difference. Certainly, not all glazes will create inspired surfaces when layered. In my never-ending quest to find new and magical combinations, there are enormous benefits from experimenting with many different types of glazes. Layering similar glazes will create subtle variations, while using highly contrasting glazes can lead to more drama. If you alternate matte and glossy glazes in layers, it will encourage surfaces to break. If you layer light and dark colors, you will get variation in both color and value. 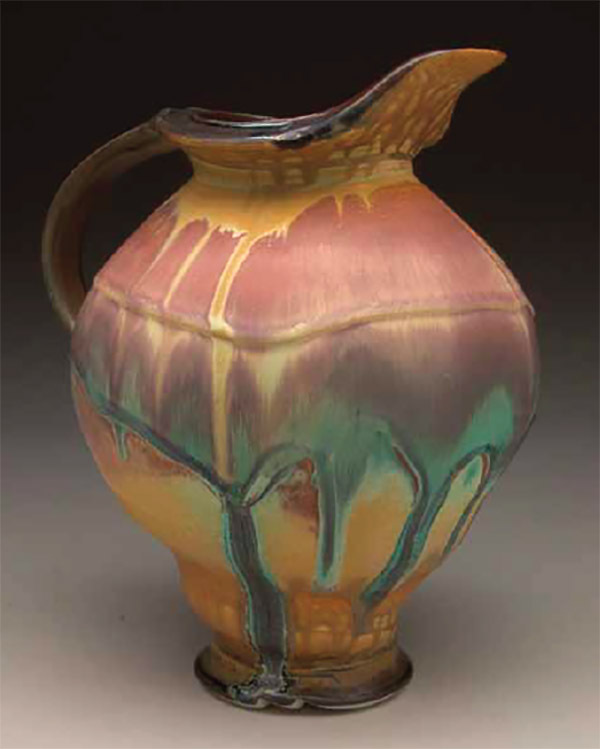 Geoffrey Wheeler uses stains to color his glazes, and he will often color both matte and transparent glazes similarly. When spraying these two glazes, he blends the matte glaze gradually into the transparent glaze, creating a surface that, while uniform in color, gradually breaks from matte to glossy. If you think about the flame, ash, salt, or soda responsible for the soft surface variations we characterize as “atmospheric effects,” the common denominator is that they travel through the kiln via the kiln’s draft. When you spray glazes, the spray has the potential to wrap around the piece and move past it in much the same way as the draft moves past a pot in a fuel-burning kiln. Spraying layers of overlapping glazes gives you the ability to create surfaces that naturally flow across a piece, softly highlighting its form. As sublime as this can be at its best, insensitive use of a spray gun can lead to surfaces characterized by obvious spray patterns and blotchy color. With experience, however, spraying glazes has the potential to integrate seamlessly with the form. Think about how clumsy and uncoordinated your hands felt when you first attempted to throw on the potters’ wheel, and compare your experience to how naturally and intuitively a seasoned potter’s hands move across the form, applying pressure just where it is needed. The results achieved as a beginning sprayer are not too dissimilar, but, fortunately, the learning curve is much quicker when learning to spray than it is for throwing! Spraying has the potential to be every bit as painterly as decorating with brush in hand. As with any painting, you will benefit from both a clear vision of what you are trying to create and the flexibility to let the process lead you in directions you never imagined. 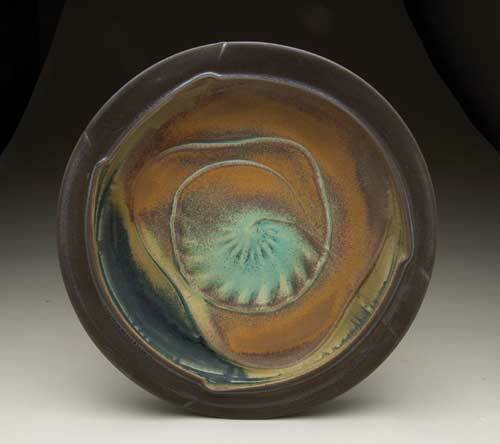 Steven Hill has been a studio potter for 40 years. He is a member of 323 Clay in Independence, Missouri, where he makes pots and teaches. clay, draft, foot, iron, microcrystalline, oxidation, porcelain, reduction, slip, soaking, spraying. The glaze recipes and firing schedule that originally appeared with Steven Hill’s March 2012 article are not included in the on-line version. Since I am a subscriber, and CM is now available on line, I tossed out my back issues. What great disappointment to find that the on-line versions are not complete! Are these formulations food safe? Fn PrtSc; open Publisher; Place in Publisher; Crop; Enlarge to your document size; Save if you wish. Print! I copied this article to share at the pottery class I am taking, but the recipes and firing schedule come out small and blurry. I had copied it onto a Word Doc. rather than printing from the webpage…When clicked to get them larger and clearer they don’t allow printing, and Control P makes the photo change to the next in the collection so no printing possibilities there.